Instant Hot Water | THERMO Spoken Here! The sketch shows a wall-mounted, electric-powered water heater that operated "on demand." There is no hot water tank. 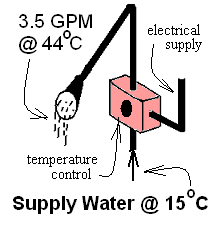 When the temperature control is switched, the device delivers water as shown in the promotional sketch. Calculate the least electrical power required? ♦ We exclude the electrical resistance coils from the system. From that perspective, this is a "heat interaction" device. Rate wise changes of kinetic and potential energy are small in comparison to the heating power. (The flow can be approximated and the smallness of these changes confirmed). The device comes to steady operation promptly. We take the system to be the water. The energy equation reduces to a single stream flow with heat. The mass rate of flow can be represented as a density time a volume rate. Now the numbers are entered and care is taken to assure units are correct. The above calculation did not determine the electric power required of the heating device. The heat rate calculated is the energy required by the flow of 2.5 gall/min of water to change from 15°C to 44°C. A different (and important) system must be analyzed to determine the electric power requirements and the design aspects by which that electric power becomes the above "heat rate" to the water.